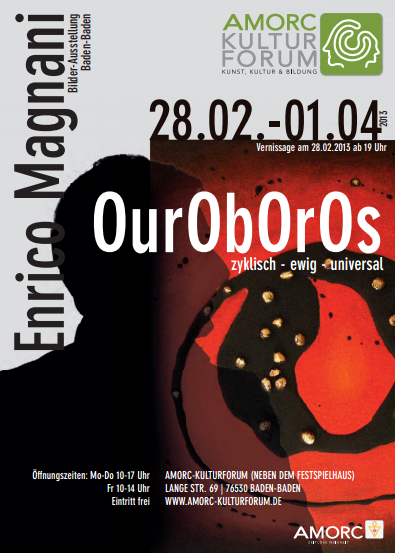 Enrico Magnani dedicates his Baden-Baden solo exhibition to a fascinating theme for all those who are attracted by ancient spiritual traditions and mystery: the Ouroboros, the mythical snake without an end and a beginning, archetypical symbol of cyclicity, eternity and infinity. Magnani, with this exhibition, offers to the public, with his captivating artworks, a unique opportunity of meditation and dialogue with the primordial archetype of our common cosmic roots. Present in all most ancient cultures and traditions, the Ouroboros, is an emblem of a constant need of spirituality for the whole mankind.